Great leaders have lived before but without an art I could not recall any of them. I hear of stories that we had some great leaders but could not picture any of them. But it will be different in this digital world. We can be able to keep the future generations informed of any happenings in this generation. Here is a loving memory of one of the great leaders and an elder in a society who has nothing but love for his people since he was born into the mountain soils of the Highlands of Papua New Guinea in the late 1940s. Waimin Abotan Awalii (pictured) a Village Court Chairman and a most humble, loving and a caring leader who hails from Waimin tribe in Wapenamanda District of Enga Province passed away in Port Moresby General Hospital on the 29th November 2015. 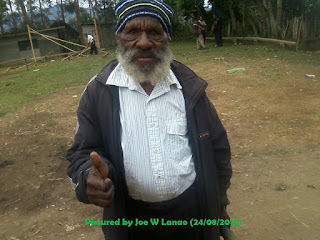 He died at the age of 73 leaving behind his 2 wives, 3 sons and 4 girls, entire Waimin tribe, wantoks and friends. His untimely passing has left a huge gap in the society and the family that will take many years to fill. Unlike many Highlanders who are naturally aggressive and fearless, this man was a real definition of an humble and a caring leader who has no grudges against anyone in his entire life. He will never be forgotten by every single person that he interacts with in his life. It’s truly a loss to the entire society. It was a sudden news from Jacob Langa, a brother of mine from Port Moresby, when in Lae, a few minutes after his passing at the hospital. It really broke my heart and was shed with tears as I recalled our days at home Yalemanda and Yambiakam. I could not rest well till morning. His tribesmen, relatives and friends in Port Moresby held a “haus krai service” at 9-Mile and contributed money, food, etc to send the body home. After 2 days in Port Moresby his body was flown back to rest at the place he calls his home, Yambiakam, the place mother gave birth in. His body was accompanied by some of our leaders and businessmen from the tribe. Wertat Markip, Robert Rasaka, Johnson A Tolabi, lady Injia (wife of Sir Salamo Injia) and Waimin ex-councilor Mosen Inu Lai and others. His body was laid to rest on the 6th December 2015. Dad you have left a vacancy in our tribe that will take many years to fill. I know, to be a leader may sound easy to some people but it’s a real challenge a leader faces, and that you did. We will always miss you. You left behind fond memories that will never be buried with you. They will always be with us in many years to come. May your soul rest internal peace till we meet again.